The Town of Walkersville will celebrate Spring and Community again this year with its annual Walkersville Days on Saturday, May 21st. 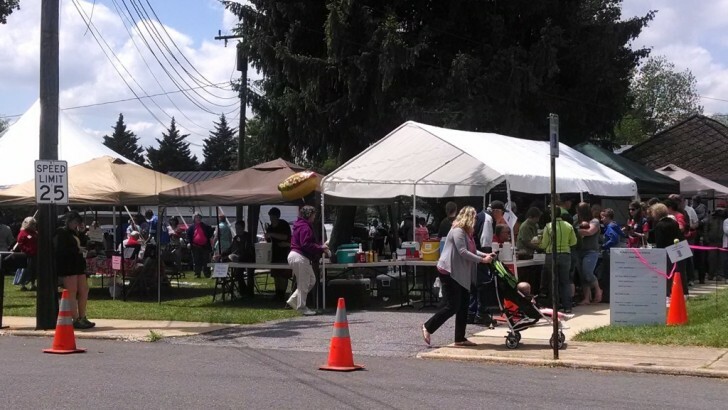 Yard sales, bake sales, church fundraisers, and an open house for the Walkersville Volunteer Fire Company beckon all to come enjoy a small-town Saturday. The whole community will be hoping for a break in the continued cool and rainy weather that has plagued the Mid-Atlantic for weeks. This weekend typically provides beautiful weather prompting many to wander through the many events in Walkersville. St. Paul’s Lutheran Church’s Strawberry Festival always draws a lot of visitors to Old Town. Live Bluegrass music entertains as folks enjoy hot dogs, chili dogs, and strawberry shortcakes. The church usually also offers a plant sale, and a rummage sale. All throughout the town, yard sales dot the lawns of homes and churches. Food stands offer a variety of fare around every corner. One of the neighbors of the Methodist church on Main Street pulls in a crowd every year with a lawn full of books for sale. Walkersville Volunteer Fire Company holds an open house for Walkersville Days. Visitors enjoy grilled hot dogs while viewing the fire fighting equipment. There are games and activities offered. If available, Maryland State Police land one of their helicopters for people to see. The Glade Valley Scout Troops will host CubMudder, a free obstacle course for boys and girls aged 4 – 14 years old. The CubMudder will be held on May 21, 2016 at the Walkersville Community Park from Noon until 4:00 p.m.. The event is free and open to all children.